Upbeat Labor Day! Would you be able to accept we're now in September?! Before you know it, I'll be wildly assembling a Thanksgiving menu directly before the occasions! In any case, before I draw out the pumpkin formulas in full mode, I have an extremely extraordinary formula that is an outright should for your Labor Day party spread (or for supper on a Friday night in case you're similar to me!). Here we have a very gooey meatless nacho dish with both dark beans AND refried beans. In addition, you can't disregard the decorated avocados and salted jalapeños. This dish meets up so rapidly, and you're allowed to include whatever fixings your heart wants with no holding back on the well done – bacon, shrimp, chorizo, Sriracha – the sky's the point of confinement! Preheat oven to 375 degrees F. Lightly coat an 8×8 baking dish with nonstick spray. 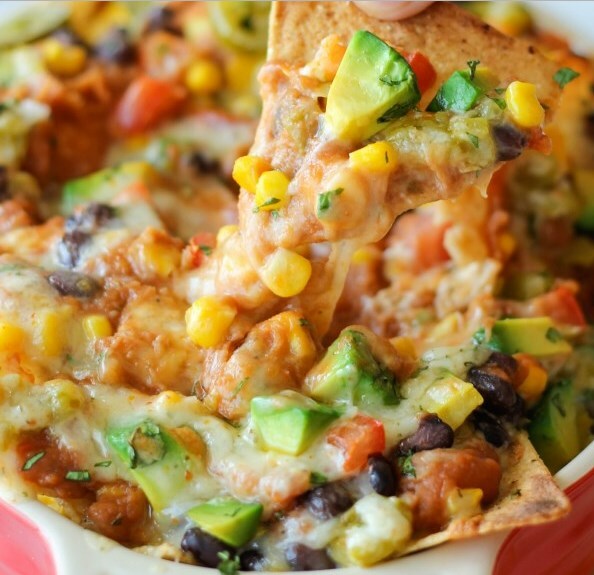 Spread tortilla chips into the prepared baking dish. Top with cheese, avocado, tomato, beans, corn and green chilis. Visit bit.ly/2KCau9g for full instructions.